Another update for the app that brought us our news in a very visual way on our iPads. 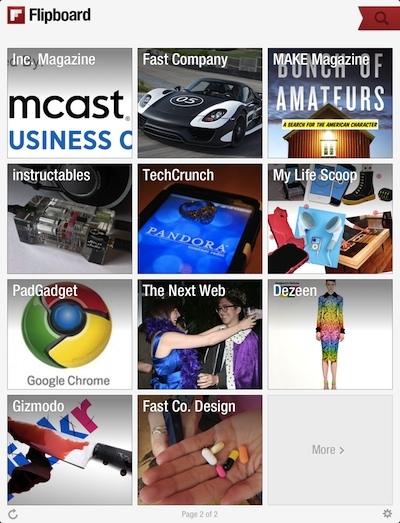 Flipboard is best known for changing a lot of people’s thinking about what a iPad app should look like. In fact, it changed how we expect to see our news. While there is still room for long lists of text headlines, Flipboard presents quick images and light text for each article, that we flip through till we find what we want to read. You choose a new/information source that appears as a square, then tap the dive into that particular provider. On the ‘new’ iPad, the colors are particularly striking. 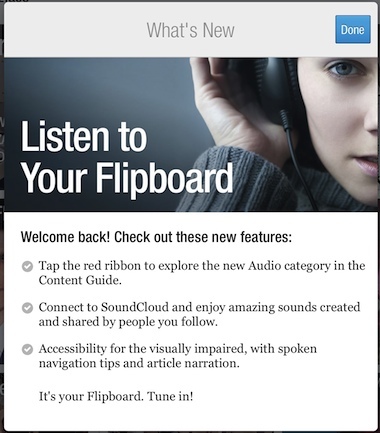 The latest update to Flipboard has gone in a slightly different direction… now information providers that distribute their news via audio instead of visual graphic is included in the same free universal app. As the update states, the audio content is in the same place you would normally go to choose new information providers. Tapping the red ribbon in the upper right corner of the screen will give you the categories with the content providers inside of each. New is the ‘Audio’ group. 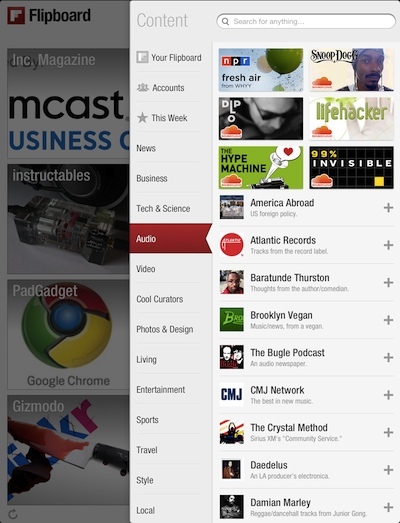 Selecting a option from the Audio list presents you with a page of that provider’s audio bits. 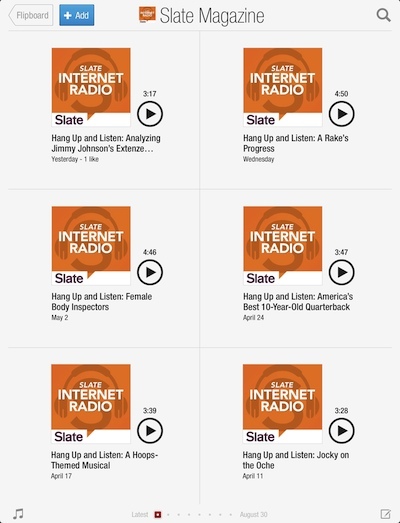 It is very much like an overview page of PodCasts. Choosing a icon will start the audio broadcast. As with any source, this is a page preview, you must tap the ‘Add’ in the upper left corner to have this group appear on your overview pages as an option to jump to quickly. For us, Flipboard is all about the visual aspect of our iPad experience so we are divided on whether everyone sees the need for audio news to be in the same app. For those that have a workspace that allows listening to their news too, the new feature extends the ‘convenience’ factor for using Flipboard on the iPad.